Hi friends, How are you? Now we are back with Tubelight movie ticket offers from Paytm and BookMyShow. 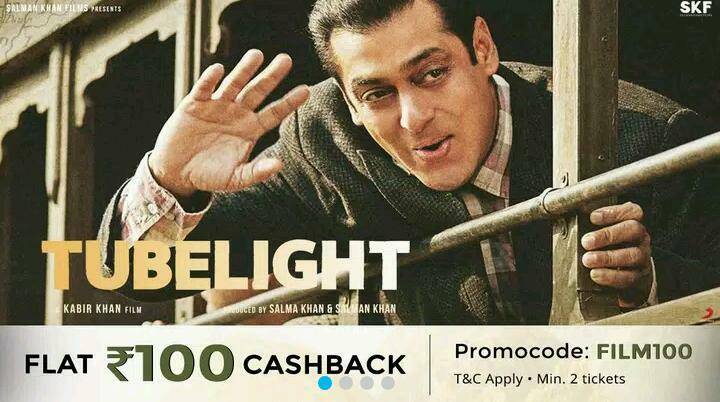 Paytm is offering 50% Cash back on booking of 2 TubeLight Movie Ticket (Max Rs 150). Were BookMyShow offering one free movie ticket. Read the full post to know how to get it! Paytm giving 50% Cash back on booking 2 Tubelight movie ticket using promocode. You will Get 50% Cashback to your paytm wallet.In this offer maximum cashback is Rs. 150. 9. The promo code is valid on a minimum booking of two tickets. ▪ That’s it! You are getting free movie ticket!! 1. No minimum number of tickets required to be purchased.